Part I of the History was written by the band's founder, Edric A. Loomis. Part II was put together by Kevin Loomis from his own memories, from hand written sketches and conversations he had with his dad over the years, and from conversing with Walter Bell. Walter was the last original band member from 1947 who passed away in 2006. 1946 was the year most of the local boys were returning from the WWII, including myself. Many were good friends with whom I had been associated in music prior to the war years. I joined the American Legion Post in St. Albans and came across an old friend named Henry Press, who was a Lt. Col. in the Vermont National Guard. Well, Henry and I got together one day following the war years when all the boys were arriving back in town. I mentioned to Henry, "We could have a great American Legion Band with all the guys coming home". He immediately agreed. 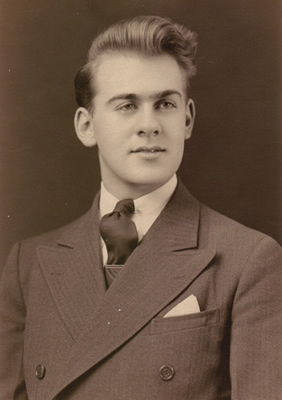 Henry, being an army officer and having influence among the American Legion officials, got approved for sponsorship of a band. So he told me to go ahead and muster as many of the boys as I could for a meeting at the Legion Hall. We ended up with about 50 musicians. We elected officers and I was elected conductor. 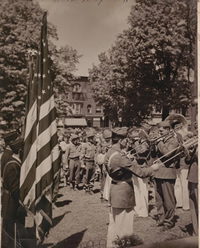 The Legion Post appropriated $1000.00 per year for music, equipment, and instruments. The year was 1947. We immediately started playing concerts in Taylor Park drawing huge crowds, as well as playing at events around the county. Well in 1948 the new commander coming to take over the St. A. Legion Post decided he didn't want to spend any more money on the band, but use those funds to support Legion sport activities instead. The band was reformed in 1949 and called St. Albans Citizens Band. 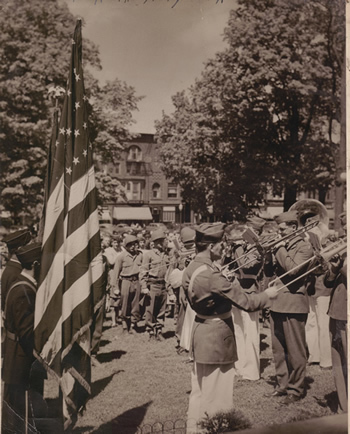 When it became apparent after many tries that St. Albans wasn't going to sponsor the band with an annual stipend, "St. Albans" was dropped from the name and we became Citizens Band. Sometime in the 1960s or 1970s when citizens band radios became popular, to keep confusion at a minimum Eddie (and probably band members) elected to add our middle name, and we officially became Citizens Concert Band. Eddie bought music out of his own pocket to start up the band along with some of the music from the American Legion Band. As the band started to play concerts, donations were taken as boxes were passed around the audience so more music could be purchased. In 1949 the band, augmented with a string section and a chorus brought together by Edric, put on Vermont's first full Messiah. It was performed in St. Albans City Hall to a packed, standing room only house. The full Messiah just wasn�t done in Vermont in those days. It was ground-breaking. The band has been going strong ever since. In 1959, the Swanton Festival was formed and it hired the band to play. From 1959 - 2004, the band played the Festival every year except one. The band started out playing Sunday nights but eventually changed to Wednesday nights as concert night. That night has been unchanged since the late 1960s or early 70s. Eddie lost his wife in May of 2003 and developed some health problems of his own. He asked his son, Kevin, to take over in his place. Kevin had misgivings about doing so because he knew the big shoes he would have to fill. But, Edric needed the change so Kevin agreed. Eddie attended all but two concerts that summer, sitting quietly in his car and observing, listening. He later told Kevin, "The band is in good hands, they don�t need me anymore". It brought tears to Kevin's eyes to see Edric giving up his life's project since 1947. 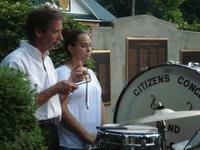 At each concert that summer, Kevin urged his dad to conduct, even if just one march. He never did. All desire to do so died with the passing of his wife of 63 years. Edric passed away on October 16, 2003 following the first and only concert season he hadn't conducted since he was 28 years old. He was 84. In December of 2003, Kevin and Elaine Magnan, trumpet player with the band, went before the St. Albans City Council with Elaine's idea of receiving permission to rename the bandshell. It was unanimously approved. 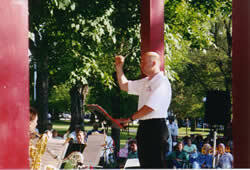 On June 23, 2004 the band, led by its new conductor, Kevin Loomis, and The Community Singers led by Linda Smith put on a grand performance during a dedication ceremony to rename it Edric A. Loomis Memorial Bandshell. Kevin�s two siblings were also on hand for the event. Brother Rick (a former trombone player in the band) from Atlanta, GA was the Master of Ceremonies and sister Ferne from Victory, VT ran the refreshment tent, the raffles and donations. On November 28, 2004 we performed a Christmas Concert at the First Congregational Church to a packed house. The band was joined by Linda Smith and The Community Singers, with the band and chorus each peforming half the concert. The concert was so well received that Christmas performances by the band and chorus followed in 2005 and 2006. 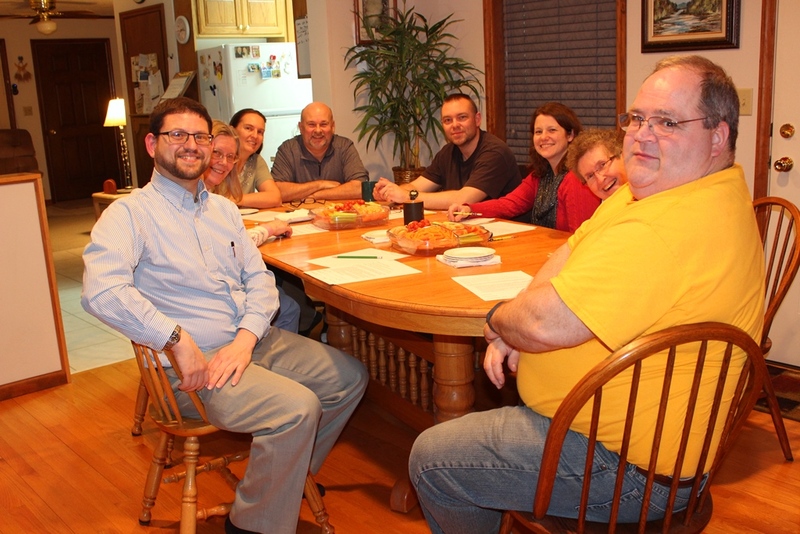 Kevin and Louise turn over the keys to the band at a meeting of the Citizens Concert Band Committee on February 24, 2016. 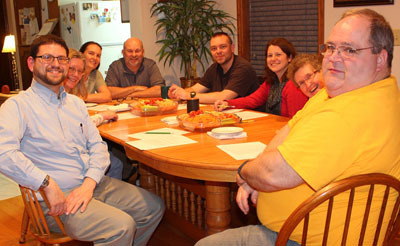 Left to Right: Jeremy Berger, Elaine Magnan, Louise Loomis, Kevin Loomis, Chad Jenkins, Jennifer McConnell, Virginia Bessette, Peter Roach. Not present: Committee member AJ Banach. In 2016, Kevin and Louise Loomis turned over the management, directorship and care of the Citizens Concert Band to Jeremy Berger (director/co-manager) and Jennifer McConnell (assistant director/co-manager) with the assistance of the new Band Committee when needed. The band is extremely grateful to Kevin and Louise for their many years of hard work and dedication to the band, and will do our best to carry on this great tradition. Kevin and Lousie continue to be part of the band as musicians. They are enjoying the new leadership as they relax and help us to make good music.